We have over 100,000 books on wide-ranging topics, from encyclopedias and handbooks to in-depth scholarly works. All of our books are online—we do not own or send out any physical copies. Books can be found in individual book collections as well as some research databases that primarily have articles (see the full list). 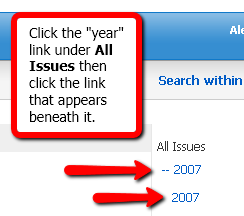 You can also search for all of our books at once using the Library book search. 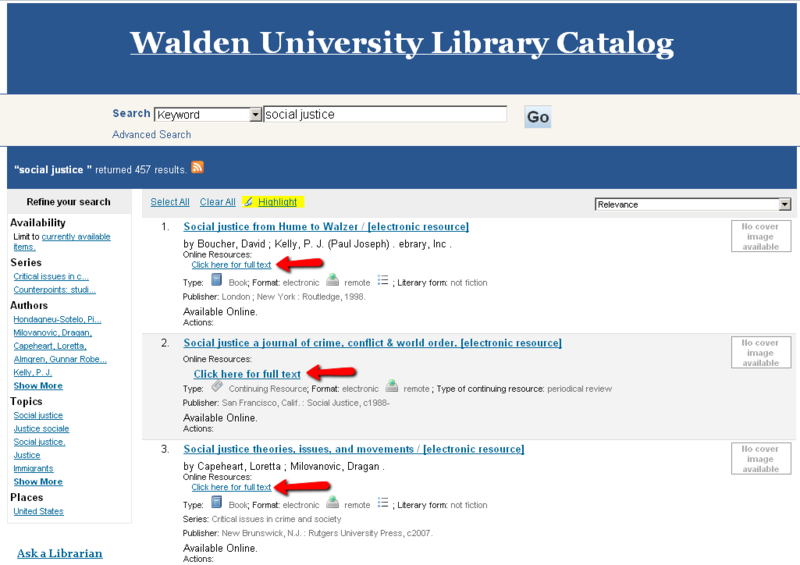 The catalog searches all books, as well as journal titles (but not individual articles) and Walden dissertations and project studies. While it’s advantageous to search all books at once, it’s difficult to sort out journals and dissertations to look only at books. 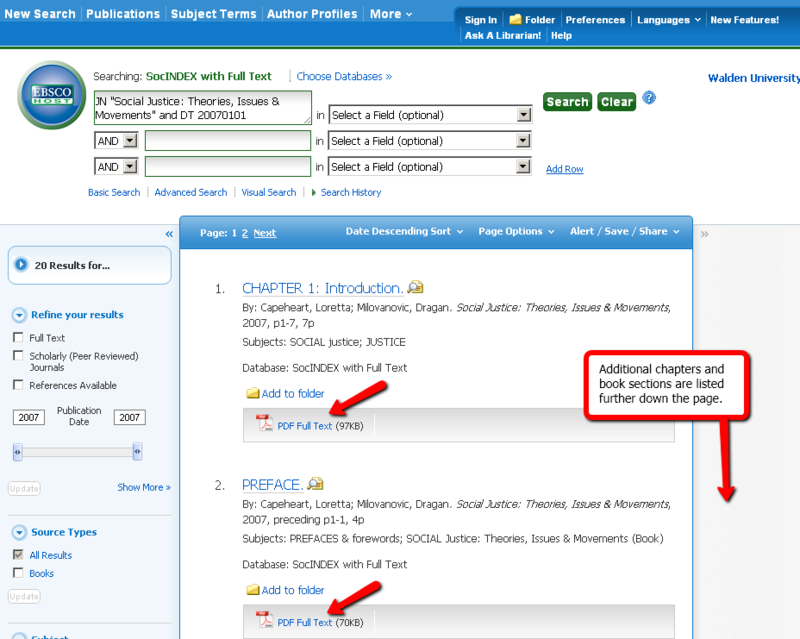 You can search by title, author, subjects, and keywords in the book summary or chapter titles, if available. You cannot search the full text of the book to discover it. If your topic is narrow or obscure, you will need to search using broader terms—ones more likely to appear in the book or chapter titles. For example, to find books that discuss nursing theorist Lydia Hall, you will get no results if you search for "Lydia Hall." Instead you must search for "nursing theory" or "nursing theorists," and then search within individual books for mentions of "Lydia Hall." Difficult to browse by topic or subject area. Find only books in the individual book collections. While it’s useful to focus only on books, you’re limited to that one collection. To capture everything, you will need to search separate collections individually. 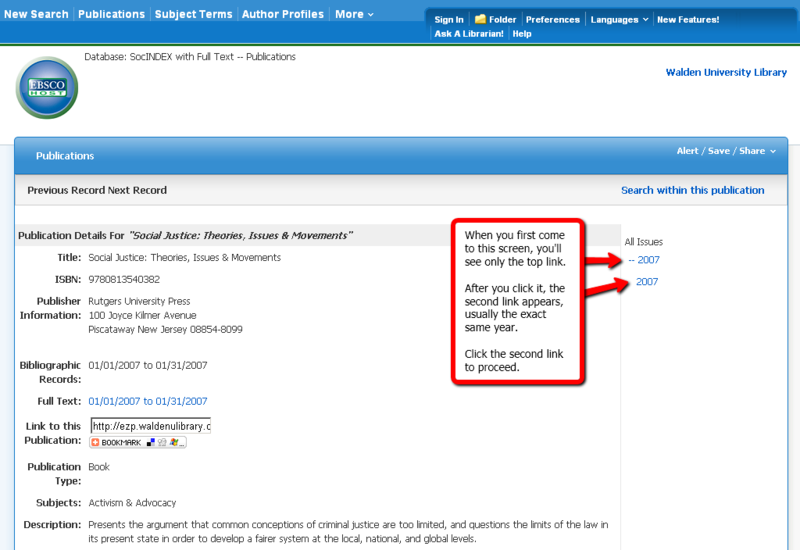 You can search by title, author, subjects, and keywords, plus the full text of books. This is useful for finding narrower and more obscure topics, including the names of people, places, etc. For example, you can search for nursing theorist Lydia Hall in the full text of books and easily find which books mention her. 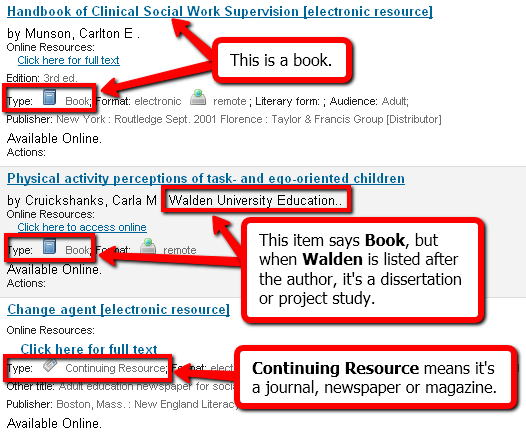 However, you will need to search for Lydia Hall in multiple collections to know you're finding all relevant books. Easier to browse by topic or subject area. 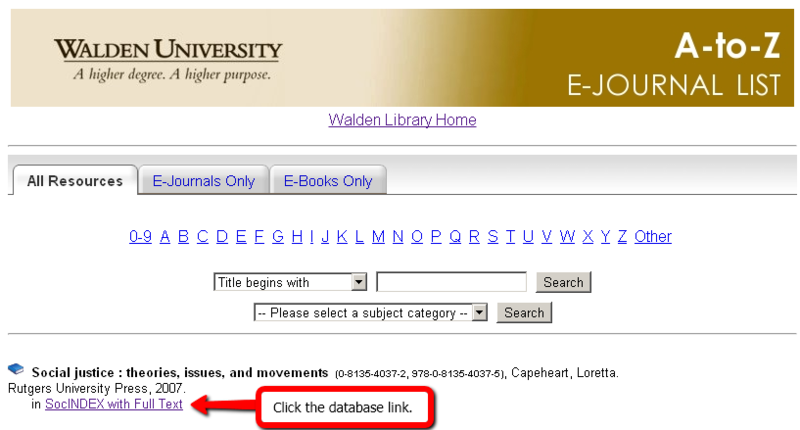 Use the library catalog to search multiple e-book collections at once, plus journals and Walden dissertations. Enter terms into the search box and click Go. To view an item, click the full text link. The book might open right away, but sometimes it takes additional clicks. It depends on the database. Choose the chapter(s) you want and click PDF Full Text. Every book in the catalog has full text, so if you can't view something you find, contact us! View all of the library's full e-book collections. We do not have textbooks in the library. Buy required texts at the Walden Bookstore, or wherever you want — just be sure to get the right edition! In some courses, your textbooks will be sent to you. If you have questions, call 800-325-3252 or contact the Bookstore. My textbook hasn't arrived. Help! Though the catalog includes dissertations, if you want them specifically, it's best to use the ProQuest Dissertations and Theses Database.